One of the most beautiful elements of baseball is its unpredictability. In any given at-bat, absolutely anything can happen. ANYTHING. What we don't expect is for that randomness to continue. Give baseball a week, maybe a month, and everything should return to normal. The stars will remain the stars, the scrubs will remain the scrubs and order will be restored to the universe. That's what makes the National League's hitting leaderboard so unbelievable. Every team has played more than half its games, creating a sample size that should be plenty big enough for the usual suspects to take their rightful place atop the league. Instead, three shockers led the league in park-adjusted offense through Monday's games. These three unlikely mashers all have fun stories to tell -- about redemption, the vagaries of prospect rankings, and how seemingly ordinary players can become extraordinary. To say that the Dodgers didn't expect much from Matt Kemp when they reacquired him last winter would be drastically overstating their optimism; they wanted him gone, by any means necessary. Sure, they'd traded not one, not two, not three, but four players to the Braves in December to bring Kemp back to the place where he first became a star. But those glory days in L.A. had become a distant memory over the previous three seasons, with Kemp falling out of shape and becoming a gigantic defensive liability, his bat becoming far too pedestrian to make up for the other holes in his game. The Dodgers had traded all those bodies for the sole purpose of dumping some onerous salary commitments. Though it was a long shot, they hoped that ditching one albatross contract -- Kemp's -- might be a bit easier than chucking multiple bad investments. Instead, predictably, the Dodgers found no takers for Kemp's services. So they invited him to spring training. If everything broke right, maybe Kemp could become an effective part-time player, hitting enough to at least partially mask his diminished speed and athleticism while holding the fort until a spry outfield prospect or two could emerge and kick him out of a job. A funny thing happened on the way to the glue factory, though: Kemp started raking. He stormed out of the gate with a monstrous April, batting .339/.373/.597. He was beastly again in May, hitting .361/.379/.551. Then after a pullback in June, he crashed into July with authority, going an incredible 8 for 9, with eight runs batted in over his first two games of the month. Kemp's terrific .323/.359/.565 line through Monday made him 50 percent more productive than the average National League hitter (per wRC+), the third-best mark in the league on a park-adjusted basis. You can find all kinds of reasons for Kemp's sudden and dramatic rebound. He got into much better shape, reportedly losing 40 pounds over the offseason. He's swinging at fewer pitches out of the zone than he has in four years, roping more line drives and making more frequent hard contact in the process. Still, Kemp's resurrection might simply come down to a case of sticking with a great player, even if it's been years after he's last looked great. Every once in a while, the guy nobody seems to want turns out to be a gem. Over the past few years, we've become spoiled rotten by megaprospects who've burst onto the scene and instantly become elite big-league players. Carlos Correa, Aaron Judge, Francisco Lindor ... the league is overflowing with young stars who've made an instant impact. This season has been no exception. We've been raving about Braves five-tool rookie Ronald Acuna Jr. from Day 1. We've marveled at Nationals teenage phenom Juan Soto's precocious and explosive approach at the plate. Gleyber Torres has fit right in as the newest member of the Baby Bombers. Yet one kid flew completely under the radar heading into this season. Granted, he wasn't actually a rookie, having managed nearly 300 big-league plate appearances prior to 2018. But rookie or not, he'd also faded into obscurity seven years after earning the honor of getting drafted in the first round by the Mets. He'd failed to bowl over talent evaluators, cracking the top 100 prospect rankings just once, topping out at No. 72 per MLB.com's board. Brandon Nimmo is now proving the doubters wrong. Through Monday, he'd bashed his way to a .264/.381/.524 line, 51 percent better than league average after adjusting for pitcher-friendly Citi Field, the second-best mark among all batting title-qualified NL hitters. Nimmo's terrific batting eye had never been up for debate. 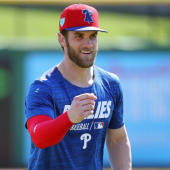 He ranked as one of the most prolific walkers at every level of the minors, with a robust 15.3 percent free-pass rate in his 69-game apprenticeship with the Mets last year. Whether you're swayed by Moneyball or maybe even Branch Rickey 60 years earlier, you know that walks are a valuable offensive weapon, much more than merely a failure on the pitcher's part. Still, the best outcome for a hitter is and always will be walloping a baseball into the stratosphere. When we get excited about hitters with sound plate discipline, we're hoping their discerning approach will allow them to lay off pitches out of the zone, then hammer the occasional meatball that floats into their happy zone. Walks are supposed to be what happens when that meatball never arrives. The juiced ball in today's game, and the resulting swing-for-the-fences tack taken by many of today's best hitters, has upped the ante. When a hitter shows a mature approach in the minors but fails to hit for tons of power, it's OK to wonder what might happen if that hitter can make it to the Show, where baseballs currently fly off bats in a way they simply don't in the minors. That, along with the kind of healthy development that can lead a talented 25-year-old to break out, is how Nimmo went from being a walk-happy slap hitter with 40 homers in more than 2,500 minor-league plate appearances to a hulking terror in the majors. He blasted 12 home runs, and a total of 27 extra-base hits, in his first 216 at-bats this season with the Mets. And while you don't want to impose limits on what a young player might do if given the right opportunities, the lefty-swinging Nimmo has been absolutely devastating against right-handed pitching, batting a huge .279/.398/.578. The 2018 season, like so many before in Queens, will be a year to forget for the Mets. But Brandon Nimmo has offered one hell of a silver lining. The best hitter in the National League this season wasn't anything close to a hitting prospect when his big-league journey began. In his rookie season of 2014, he batted just .242/.316/.336, ranking just 138th in slugging percentage out of the 163 American League hitters with 250 or more trips to the plate. In both its 2014 and 2015 season previews, Rotowire projected him as a likely utility player. After his unimpressive rookie campaign, Fangraphs described him as a "good fielding shortstop with limited hitting ability." That player is Eugenio Suarez. And man, did we all whiff on this guy. The 26-year-old Suarez has moved from shortstop to third base as his big-league career has marched on -- and far, far away from his previous label of utilityman. His initial breakout actually came last year, when he batted a solid .260/.367/.461 while playing better-than-average defense. That effort earned him a contract extension that even his biggest fans would've never imagined: a seven-year, $66 million megadeal, one of the longest guaranteed contracts for any major-league player. Rarely has any player made a deal that big look like such a colossal bargain so quickly. Through Monday, Suarez was hitting a massive .306/.391/.565, an aggregate line 52 percent better than the average MLB hitter. He padded his lead atop the wRC+ leaderboard Tuesday night, reaching base three times and blasting his 17th home run of the season. Like Nimmo, Suarez has shown what can happen when a player with a good eye finds his power stroke. After registering double-digit walk rates at four different minor-league stops, Suarez hiked that mark to 13.3 percent last season with the Reds, lofting a career-high 26 homers too. This season's improvements include a sharp drop in his strikeout rate, and a quantum leap in his hard-hit rate: No NL player, not Paul Goldschmidt, Freddie Freeman, Bryce Harper, or anyone else, has made hard contact more frequently than Suarez has in 2018. Though they've played better under interim manager Jim Riggleman, the Reds are still well on their way to their fifth-straight losing season. They offer a stark reminder that not every rebuilding team finds the pot of gold at the end of the rainbow the way last two World Series winners did. The good news is that Cincinnati boasts one of the most potent corner-infield combinations in the game. The first baseman is a former MVP who's still a very tough out in his mid-30s. The third baseman is a player who wasn't expected to do much but make a few nice defensive plays, fill in for flashier teammates when they got tired, and otherwise ride the pine. As a great scholar once said, "There's one word that describes baseball: You never know."